The summer is always a really quiet time for me during which I don't sell very much or tend to get any new work coming in. In a way this is a good thing as I also have the school holidays to contend with, and it's useful to use what time I do have to plan for the autumn and reassess what I'm doing, but after the worst period of sales/new work I've experienced since starting my business (and a dead summer season which started 2 whole months earlier than usual) my optimism is distinctly lacking. Like most people I know I do tend to scroll through social media when I'm procrastinating and I've been doing rather a lot of that lately. For a change I'm not really comparing myself to others as it seems we're all having a really hard time of it at the moment - I wonder whether this, combined with increasingly bleak news, is actually getting me down more than the usual "so and so's much more successful than I am" nonsense. When everyone's struggling, where do you turn? Now obviously I have the wonderful Just A Card team and all our fantastic supporters - we're all here giving each other a little lift, and I appreciate the opportunity that working on the campaign gives me to stop worrying about the other stuff for a while. But it does feel hard shouting about other people's work when you can't sell your own! I've been reading a couple of books recently which are making me realise that if nothing else I need a bit of a social media audit this summer. I don't want to be constantly refreshing stuff and getting frustrated when I should be either having a nice time with my son, or using the opportunity of quiet time to come up with something new and exciting. Matt Haig's new book Notes on a Nervous Planet (shown above minus it's dust jacket because look! It's rainbow coloured!!) talks about how the modern world (and social media/being constantly switched on) is leading to increased rates of stress and anxiety. At the time of writing this I'm just over half way through and devouring every page. I don't think I'm the most extreme example but I definitely find it very hard not to check my phone. Not helped by the fact that I need it on - what if school calls or there's an emergency? And I love to take photos using it (whether for the purpose of posting to my Instagram or not). I discovered when my phone broke earlier in the year that the anxiety caused by not being contactable was so great it far outweighed that created by constant Twitter scrolling. I've been looking at social media blocker apps (Freedom in particular is supposed to be a good one and seems to do everything I'd want) but I'm not sure I can stretch to the cost at the moment (as I don't have any money coming in!). I'm thinking I'll need to do it the old fashioned/free way. Accepting that I'll be more anxious without my phone than with it, I'm going to start using the alarm clock combined with diary reminders to set myself times each day when I will not look at social media. I can check my emails, send and receive calls and texts, take photos if I want to but no Twitter, Instagram or Facebook. Let's see how that goes! After all if I were at work every day, rather than working for myself from home, I'd have no choice but to do that anyway. I'm aiming for set times each day and I have the alarm set now as I'm typing this so I can't be distracted! The plan for the summer holidays then... I'm only going to be writing this blog once a week for the next 7 (I currently blog twice a week - had you even noticed?!!). I want to keep it going because I enjoy it. I'm aiming to schedule tweets throughout the summer, not force myself to post to Instagram every day. I also see this as a good opportunity to question why I keep picking up the phone - am I procrastinating? If I am I need to put it down and get on and do that thing I'm putting off - I'll feel great when I have! Am I bored with what I'm doing? Do I have 15 minutes spare before the school run? Well, why am I bored and is there anything I can change? Why don't I read a book or just sit quietly for 15 minutes making the most of the peace and quiet - like I used to do... I so often say I'd love to have the opportunity to be bored. Are you completely hooked on your phone or do you already have this all sorted? Any (not too drastic please!) tips for managing time better? I'm hoping any changes I make over the holidays will continue once we get into the autumn. I love the internet and I'm a massive fan of social media (Twitter in particular which has given me so many opportunities over the years) but I think the time has come to start using it better (and most definiely not more!). Notes on a Nervous Planet by Matt Haig is published by Canongate, and undoubtedly available in your local independent bookshop! 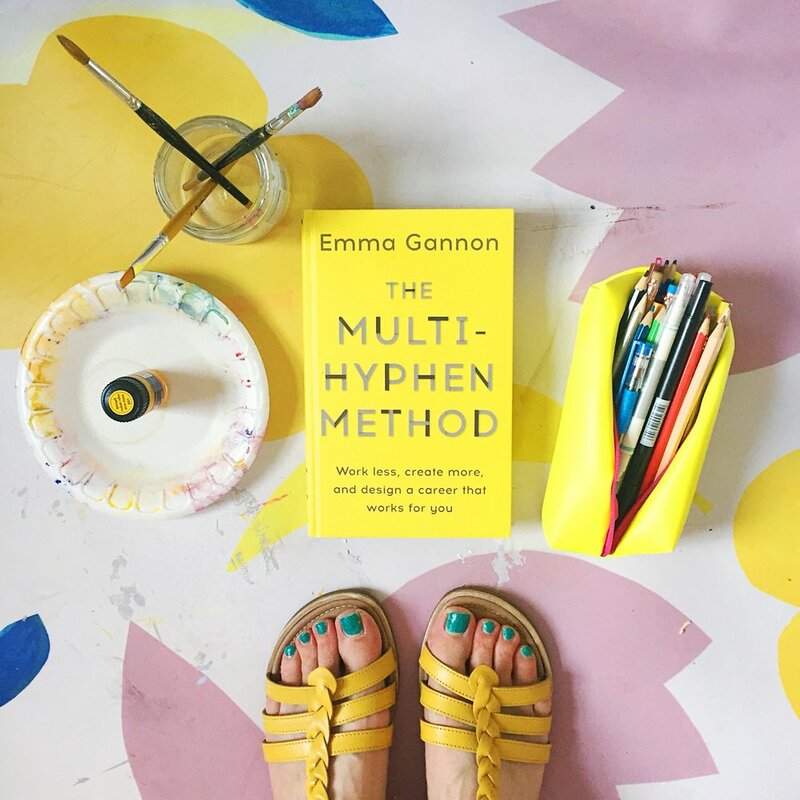 As is The Multi-Hyphen Method by Emma Gannon, published by Hodder & Stoughton.